Veterans, widows(ers), Gold Star Mothers & military family put this event on your calendar! 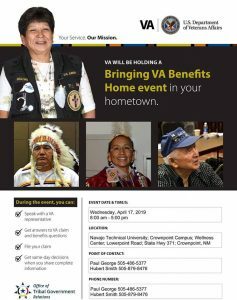 Ask questions, start a claim or get information at this wonderful event at Navajo Technical University in Crownpoint, NM on Wednesday, April 17, 2019 from 8am to 5pm. Please share!